Coach House Books is about as venerable an indie institution as possible in Canada. For over forty years they have been publishing on the edge of Canadian literature (miraculously surviving many close calls) and binding things that the bigger companies overlook. In recent years they started what I thought was a new focus on all things local with the publication of the uTOpia series as well as the Concrete Toronto and HTO volumns (a few of which I participated in). I knew they — and people associated with them — were involved in the local and Canadian art scene over the years, but had no idea of the depth until I saw the Coach House show that opened with the reopening of the AGO two weeks ago. I keep revisiting this gallery on each trip to the AGO to find out more — the exhibit looks at Canadian Art “through the lens” of folks associated with Coach House, and there is much Toronto to see here. The central Coach House table and walls are full of ephemera produced in the 1960s and 70s: posters for art exhibits and various semi-political events; the famous CN Tower “Fall Zone” poster; photos of people involved with Coach House over the years (all those 1970s beards) — it’s very much a documentary exhibit, with the posters actually stapled to the wood as they would have been out in public. 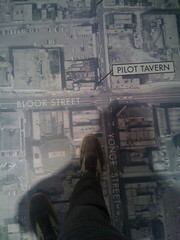 A neat addition is a large aerial photo of the Yorkville neighbourhood taken circa 1967 (Rochdale College at Bloor and Huron is just under construction) underfoot. Most remarkable about this view is how many parking lots there were in Yorkville. I think if we were transported back 40 years to the mythic Yorkville’s heyday we’d be stunned by all the open space and parking lots. American draft dodgers who were intimately involved in this scene. It’s a fun and exciting exhibit, and one of those moments where I realize how much of the past I’m not familiar with because its been kept out of sight on somebody’s shelf for too long. Lots has happened in this city and country, but we (Canadians) aren’t as good as keeping those memories alive as perhaps our American friends are. This show at the AGO will do a lot to keep a lot of this work active in our imaginations, and maybe add to what we think of Toronto today. Gallery photos courtesy of Stan Bevington at Coach House books. Foot photo by author. Thanks for posting this. I’m definitely going to visit this exhibit tomorrow! old Toronto neighbourhood maps/photos are always fun to see!